It’s spring on the Oregon Coast and adventure waits at every turn; when the tide goes out the dinner table is set for thousands who gather to dig razor clams at Gearhart Beach in Oregon’s Clatsop County. Fick was quick to remind me that each clammer must keep the first 15 razor clams that he or she digs, regardless of clam size. In addition, each clammer – 14 years old and above – must purchase an Oregon Shellfish License. 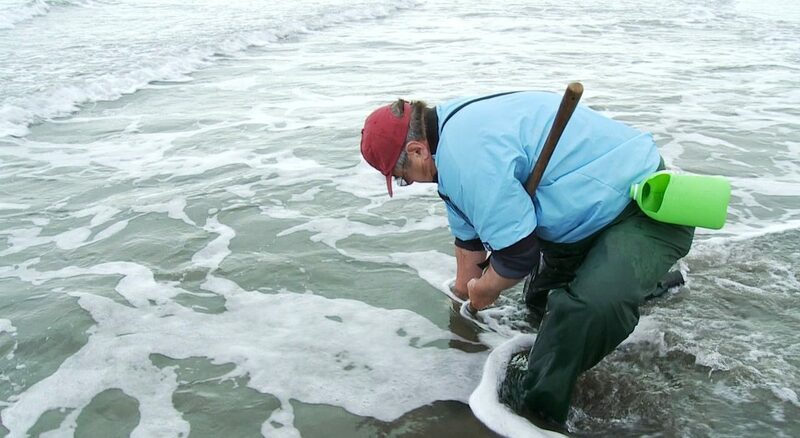 Further, each clam digger must dig their own clams and have their own container. The best time to go is a couple of hours before the low tide – and the lower the tide the better, so check an Oregon tide table for the best dates and times. 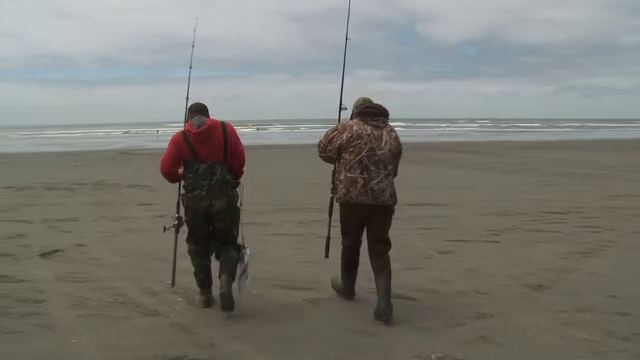 If you come, keep this in mind: when the clam tide ebbs and turns to flood there’s another fishing sport that takes over on the beach, and it’s worth checking out too. He recommends anglers start with a fishing rod anywhere from 9 to 12 feet long. “That longer rod keeps your line out of the water and you can cast a lot further with a longer rod,” said the longtime surf angler. 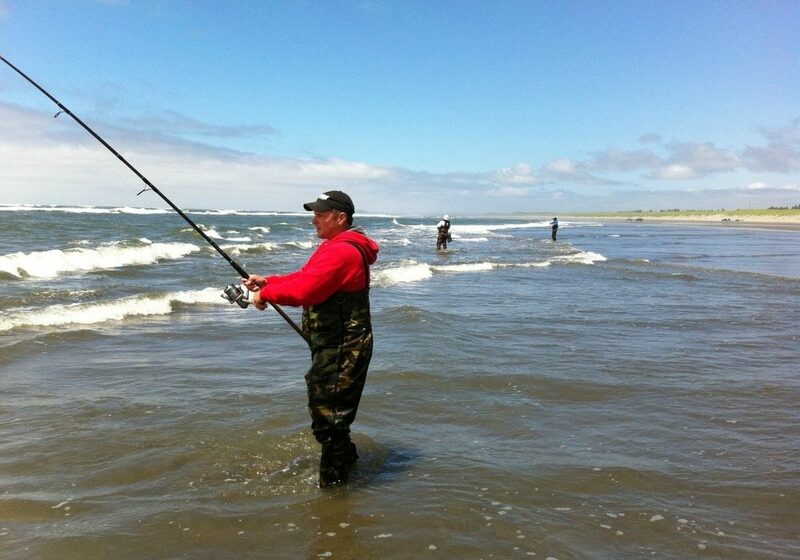 Back on Gearhart Beach, Milanowski agreed that he loves the isolation of the surf fishing experience – although he enjoys the company of his friends too. I followed Jim’s lead and used clam necks for bait – although he added that “sand shrimp” are tough to beat too. An Oregon angling license is required. Stand sideways to the waves. You take less punishment from the power of the surf that way. Wear a life jacket. I prefer the lightweight inflatable style but I also will wear my USCG approved float coat. 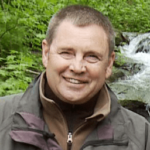 Fish the incoming tide – you’ll have more success! Jim said his reward is not only a fun of a uniquely northwest fishing trip, but the chunky surf perch are exciting to catch and delicious to eat. Moreover, the experience provides a uniquely satisfying and somewhat intimate day with the environment of the Oregon Coast. Filet each perch and douse each filet in an egg bath. Coat each side of the clam in panko and soda cracker meal. The combination provides a nice coating to both sides of the perch filets. The preheated and hot frying pan contains a generous amount of vegetable oil. Cook the perch filets quickly – less than two minutes a side (until golden brown on each side.) Drain each filet on a paper towel. I enjoy combining the cooked perch with a generous serving of coleslaw.